Bradley Cooper, as well as being a hugely successful actor-turned singer (lest we forget A Star Is Born), is apparently just an all-round great guy. Despite the actor’s character in The Hangover being – let’s face it – a pretty crappy friend, this apparently couldn’t be further from the truth in real life. 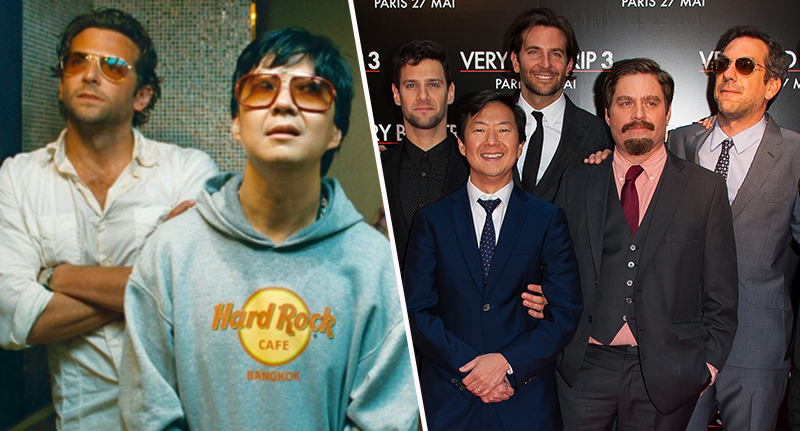 His co-star on the successful flick, Ken Jeong – who played the hilarious Mr Chow – has given a heartfelt interview in which he describes Cooper’s friendship and compassion during the most difficult period of his life. Comedian Jeong told Entertainment Tonight, the Silver Linings Playbook actor helped him and his wife when she was being treated for breast cancer. His wife of 15 years, Tran Jeong, was diagnosed with breast cancer in 2008 – one year after discovering a hard lump in her breast while breastfeeding the couple’s twins, ABC News reports. The fine needle to thread in terms of comedy is to try to find light where there is darkness. The fact that I was also a physician and Tran being a doctor, we found a way to break it down medically. And after the first dose of chemotherapy, her tumour responded, so we kinda knew even after the first dose, okay, y’know, we’re really turning round the corner but she had 12 more rounds of chemo to go. Tran is my role model, my hero – even if we weren’t married. I mean, she is just really the strongest person that I know. He [Cooper] drove me from Vegas to LA to be with Tran, and Tran was too weak from the chemo and couldn’t travel, so we were in LA for the holidays and Bradley had us come over to his place and be with his family. It got me through the most difficult period of my life. So not only did the A Star Is Born actor drive Jeong to be with his wife, he also invited the couple into his home during the holidays when it became apparent Tran was too sick to travel. Good for you, Bradley. I’m not crying, you are.